Who are the jokers you know in rugby? There’s good banter at Wasps and Elliot Daly is always up to something. For Wales, Paul James and Richard Hibbard are like Phil and Grant Mitchell when they’re together. They have a love-hate relationship. What’s the funniest thing you’ve heard on the pitch? When I was at Cardiff Blues and we played Toulon, Lou Reed was trying to get into Gethin Jenkins, who was playing for them. At a ruck, Gethin was on the floor and Lou said, “Gethin boy, I’ve changed my number. I’ll text you after the game.” It was quite surreal. There’s the spider one in Oz. At the zoo in Sydney, I bought a very realistic-looking plastic spider. I was rooming with Luke Charteris at the time and I hid it under his sheet. When he got into bed I was waiting for it… Seeing a 7ft man jump like a little girl was very funny. Someone who’d speak to me would be a start! Jim Carrey would be a good laugh. There would be decent banter. Where do I start?! I like chocolate. I’ve got a two-year-old daughter so if I wake up in the middle of the night, I might have one of her Kinder eggs. I sleep eat! I might go to the fridge in the night, have a packet of ham and a pint of milk but not remember until I see the remains in the morning. To fly would be really good. I’d never have to walk anywhere again. I’ve found in London that no one says hello, in lifts or on the street. And people don’t say thank you when you let them in at a roundabout. People are more reserved, but I make a point of saying hello to everyone I walk past. 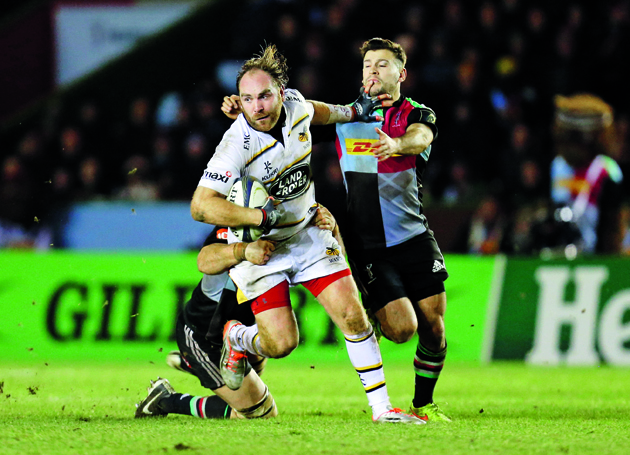 Andy Goode. He’s got great hair and isn’t short of a pound or two. I’ve dropped the ball on the line a couple of times when I was about to score, but it’s probably getting knocked out 25 seconds into a game in front of the whole Welsh nation (by New Zealand’s Andrew Hore in 2012). I’ve always dreamt of joining the police force when I retire but we’ll see. If I can’t do that, maybe plumbing or some form of building work. I’ve done my Level Two qualification as a plumber. Something I can get stuck into and provide for my family. As a good guy. Various coaches have told me to calm down and stop being a joker, but that’s part of my personality and I want to keep it with me. Sometimes I can go over the top a little bit, but I’d like to be remembered as staying true to myself. 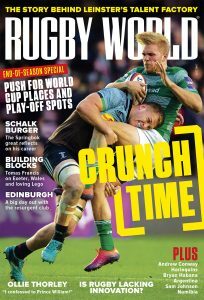 This interview was published in the March 2015 edition of Rugby World. For the latest subscription offers click here.